Host of the 1975 World Cup of Golf, Navatanee has improved with time and matured into one of Bangkok's most beautiful courses. Play is strictly for members only during weekends, but the course does allow public play during weekdays. Course conditions are somewhat average, but the caddies are very attentive and knowledgeable. Some great holes are sprinkled throughout the course including the short Par 4 5th which is one of the more difficult despite being only 329 yards, and the Par 5 9th around the water, which receives unanimous approval from all who play here. The clubhouse, whilst in a little need of some renovations, has a superb outdoor restaurant overlooking the 9th and serves up some of the best local food around. Serious golfers will appreciate this layout, designed especially for the 1975 World Cup of Golf. 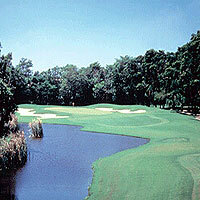 The golf course is the main attraction and it's just a good true test of golf, with no frills. Make sure you have a drink in the outside eating area overlooking the 9th after your round. The food is great and the atmosphere relaxing. Golf carts are compulsory. Tipping the caddies is prohibited, but as with most things in Thailand, that doesn't stop everyone doing it.